Posted 8/23/2018 10:11pm by Leslie Cooperband or Wes Jarrell. The moon is waxing, but the summer is waning. The forecast forebodes one last gasp of hot air and humidity (I hope it’s the last, because these cool crisp mornings of late are hard to give up) next week, but we’re moving forward with getting the farm ready for fall. Yesterday, we moved the breeding bucks to the north pasture to hang with the remaining bucklings on the farm. The testosterone and goat musk are palpable; the boys engage in endless male dominance rituals, between grazing and napping. We decided to move the adult bucks away from the main pasture so they wouldn’t be a distraction to the does. As I’ve mentioned before, we are determined to keep the girls focused on producing milk for as long as possible before breeding begins. With the promise of fresh pasture awaiting them (and a bucket of grain for added enticement), they trotted to their early fall paddock. When any new goats are introduced to an existing group, there are always the usual head buttings and posturings. It appeared that their initial interactions were tepid, and that they would all be one happy boy-group for most of the afternoon. When it came time for the evening feeding, their true dominance colors emerged. While I feared that the larger adult males would out-compete the younger bucklings for grain, to my amazement, the little guys harassed the old guys and distracted them away from the grain feeders. Their antics reminded me of teenagers distracting their parents, busy in conversation over a meal, so they could snag some choice morsels. After admiring our handsome bucks, we headed back to the barns for our next goat move. We had decided to offer three of our “pet” goats to our friends and new farmers of Moon Grove Farm. They had been pining for some goats in their lives for some time, after being smitten by some adorable Nigerian Dwarf goats on a farm in southern Oregon almost five years ago. It turns out, we had purchased two Nigerian Dwarf does from that same farm around the same time that they (Moon Grove Farm folks) were there. Each of those does had a single kid before we sold them—we named their kids Cocklebur (a beautiful multi-colored wether) and Athena (a sassy& chubby white doe, who one of our child customers calls “the naughty goat.”). Add sweet Apollo, a wethered Oberhasli buck gifted to us by a former employee, and the “three musketeer goats” were an inseparable and entertaining trio at our farm for several years. Last night, we loaded them into the back of our pick-up truck and headed over to Moon Grove Farm in Mahomet. 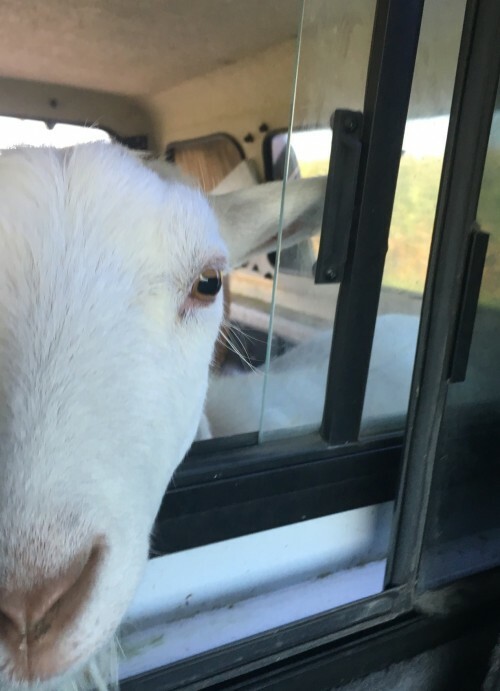 Athena, the quick-witted one, suspected something was up, peering nervously out the window, pushing her head through the cab window for reassuring petting. When we arrived at their new home, the two wethers leapt eagerly out of the pick-up bed. Athena had to be coaxed. They waddled over to paddock behind the farm’s gorgeous 100+ year-old post-n-beam barn, excited to get to work on the lush vegetation. They were uncertain why they were there, but continued to pull down weeds and pull out tender blades of grass. We stayed with them in the pasture for a while, but soon it was time to enjoy some pizzas coming out of their wood-fired oven. No sooner had we sat down in front of the oven to watch the pizzas cook, we noticed that Athena and Cocklebur were ambling toward us, bleating in distress. What had appeared to be impenetrable fencing clearly had a vulnerable opening. Despite their girth, the two had managed to squeeze between a gate post and a slight gap next to the barn. We boarded up the gap, returned to the pizza oven, and, within minutes, they came ambling around the bend again. This time, we discovered they could shimmy underneath the rungs of a pipe gate on the other side of the barn (again, amazing considering how overweight both are). After a few adjustments to block that gap, darkness overtook the clear prairie sky. We cajoled the goats into trying their new barn stall, bats dangling overhead. We petted and reassured them it was safe, leaving the light on like you would for a small child afraid of the dark. We walked back to our cooking pizzas, and after a while, their goat protests subsided, fatigue and resignation overtaking them. The bats flew out of the barn, as the radiant moon rose over Moon Grove Farm. This week’s text club special relates to several cheese specials. To get the message with the special info, you’ll need to sign up: text either “GOAT” or “URBANA” or “FARMSTORE” to 30500 to sign up. Angel Food: our little “mini-brie” or crottin style bloomy rind; this batch of Angel Food is aging nicely, with hints of cream and mushroom. Enjoy with a drizzle of local honey. Black Goat: an ash-coated bloomy with a delicate and crinkly yeasty rind. This batch is ripe, and I mean gooey in a funky but delicious way. Slice up a nice crusty bread, grab your favorite hard salami and get ready to slather on the black goat. The special is buy 1, get 2nd at 50% off. Blushing Goat: our take on a washed rind cheese—these little rounds are washed with a kombucha beer for one month. These blushing pink-orange beauties have a dense fudgy paste with a rich umami flavor. This cheese just keeps getting better and better with age. Pesto Rubbed Moonglo: fall-milk Moonglo wedges with top & bottom rinds removed and slathered with a house-made pesto (our own basil, Voss pecans, olive oil and local garlic). It looks as beautiful as it tastes. Pelota Roja: our special (and very limited) Manchego-style goat cheese with guajillo chile rub on the rind. We have a few wedges of this cheese for retail as most it goes to the Frontera Grill-Topolobampa restaurants in Chicago. Perfect grating-style cheeses, with nutty notes and gentle heat from the chile rub. VERY LIMITED—last chance on this cheese until next year. Starting September 1st, we will be shortening our open hours. Take advantage of the extended hours before summer is gone. Now through the end of August, we are open Wednesdays-Fridays, 3-7 pm, as well as Saturdays and Sundays, 1-4 pm. The farm is beautiful this time of year—lush with plant and animal life alike. Come out after work to unwind. During our open hours, you can savor a scoop of gelato or “build your own” cheese boards—pick out your cheeses, add a stick of salami (Underground Meats) or a jar of jam from Autumn Berry Inspired or pickled veggies, grab some Central IL Bake-house baguette bread and we’ll provide the board. You can sit outside under our new pavilion roof and enjoy a glass of wine or beer with cheese! Want to go the total sweet route? How about a root-beer float with a scoop of our gelato? Need to de-stress? Come visit with the goats. They love to be petted, even in the warm weather. Shop in our farm store: “The Real Stand.” We’ve got pasture-raised meats and poultry from Bane Family Meats, frozen artisan sausages from Piemonte Sausage Co., pickled veggies and pesto by Sarah (our former gelato maker), locally-grown and milled flours by The Mill at Janie’s Farm and much more. Back in the store this week: goat milk yogurt by Green Meadows Farm. U-PICK: U-picking is suspended until further notice. We hope to have enough apples and maybe pears for u-pick in September. Peaches were just not that plentiful this year. We are also planning another “Cider Days” event, so stay tuned for details. Farm Dinners: Fall season is not far away, and the September and October farm dinners are filling up fast. I encourage you to book your tickets now. The menu is now posted for our September 1st Farmer Block Party Fete—check it out! We have two versions of our 100 Yard Dinner this year: a progressive meal around the farm in mid-September and “ploughman’s feast” style meal in October; menus forthcoming. We have added a beer dinner with Half Acre Brewery for Saturday, October 6th. We’ll likely be serving some beer-cheese collaborations, so you won’t want to miss this one if you love micro-brews. Night of the Living Farm Tuesday, August 28th 7:30 or 8:00 pm start time (will depend on sunset) Join entomologists Dr. Michael Jeffords, Susan Post, and Dr. Joe Spencer from the Illinois Natural History Survey, for a unique exploration of the insects and other creatures that call Prairie Fruits Farm home. CU Symphony Orchestra to perform special “environmental” pieces on our farm on Sunday September 23rd, 2-4 pm. Visit Prairie Fruits Farm & Creamery for a free gelato social and concert from 2:00 to 4:00 pm on Sunday, September 23 to celebrate Mother Earth's summer harvest! This tribute to our planet will feature musicians from the Champaign-Urbana Symphony Orchestra performing several earth-themed chamber works by CUSO Composer-in-Residence Stacy Garrop. PFFC owners Wes Jarrell and Leslie Cooperband will bring us the latest news about their sustainability efforts on the farm. Take a tour of the farm, visit the goats, and participate in our "Messages to Gaia" community art project--where you can draw pictures, write poetry or simply share your thoughts about our planet. Come enjoy! This free gelato social is sponsored by CUSO, New Music USA, and Prairie Fruit Farms & Creamery.